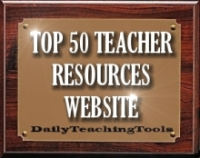 DailyTeachingTools.com offers hundreds of free high-interest writing prompts, content-rich blogs, and user-friendly graphic organizers. This site is a valuable resource for inexperienced and experienced English Language Arts teachers. The Common Core Standards for English Language Arts are part of the Common Core State Standards initiative coordinated by the Council of Chief States School Officers (CCSSO) and the National Governor’s Association (NGA) in partnership with other national organizations. 45 states, Washington, DC and the U.S. Virgin Islands joined the state-led Common Core State Standards initiative. This Dear John letter is an entertaining punctuation assignment for student pairs that demonstrates how much punctuation affects meaning. Education Week, an award-winning online and print source for K-12 education news that raises awareness and understanding of critical issues facing American schools. Education World lists 100 constructive, insightful, and original comments for teachers to use on student report cards. edWeb.net is a free, professional social network for the education community. Connect with colleagues, create PLC’s, find support for new teachers and attend cutting-edge webinars. The 5 Minute University is a video in which Father Sarducci (aka Don Novello) explains what the average college graduate remembers five years after graduation. Freedom Writers: MovieClips.com created an HD clip of a student reading his journal entry about how Ms. Gruwell's (Hilary Swank’s) class gave him hope. There is also an SD version with subtitles available on YouTube. Hunger Game Comics drawn by Nicole Stevenson, an illustration major at Maryland Institute College of Art, can add a little levity to your literature/reading mini-lessons. Check her out at Ginger Haze. KleenSlate offers free samples of low-tech, hand-held dry erase paddles that are perfect for promoting high-interest, interactive learning and for administering quick, formative assessments. English Language Arts Products at Amazon offers elementary and secondary Secrets of Teaching products (sold individually), designed to support the Common Core State Standards. The Literature Circles Resource Center created this research-based overview on the premise that there is no one way to do literature circles. Quizlet allows teachers to create free custom flash cards or choose from free sets of pre- made flash cards, covering every possible subject. Research Paper Guide posted by the Cambridge Rindge and Latin School is a step by step guide for writing a research paper. All steps are accompanied by clear examples. Teacher Files has a collection of free graphic organizers on site to help students demonstrate comprehension of text. Teaching Channel is a video showcase of innovative and effective teaching practices in America's schools. This Reader’s Workshop video - featuring Rick Klieine in his fifth grade classroom - captures the essence of Reader’s Workshop in a film clip that is less than six minutes long. The University of Wisconsin STOUT has a free collection of rubrics for assessing portfolios, research reports, Power Points, podcasts, oral presentations, blogs, and other web 2.0 projects. The US Dept of Education is dedicated to the goal of ensuring equal access to education and to the mission of promoting educational excellence throughout the nation. Watch Know Learn has thousands of free videos available from Teacher Tube, YouTube, and Google Video, organized and searchable by subject and age group. Write Music is a lesson on sentence variety written by the late Gary Provost and reprinted by Richard Nordquist. The Writer’s Notebook is an article published in the NJEA Review containing information on how to set up a notebook along with several introductory lessons. The Writer’s Notebook PowerPoint Screencast is an instructional video available on the Galloway Township Public School website narrated by Christa Atkins, Annette Giaquinto and Janice Malone. The Ninety Second Alphabet is an improvisational scene from Whose Line is It Anyway in which the characters argue/dialogue in alphabetical order.